My philosophy is to offer massage in a relaxing and healing atmosphere. I have found over the years that the combination of heat and oils along with the massage has a profound effect on relaxation and pain relief due to tension or injury. 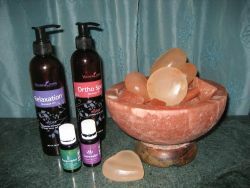 Organic Grade A essential oils are used, hot salt stones specifically on the neck and upper shoulder and moist heat along the spine - I incorporate these modalities with all massage sessions. Lorenne McCormick graduated from Potomac Massage Training Institute in Washington DC in 1992. Since then she has been NCBTMB certified and has her own private practice. She holds a massage license in both the state of Maryland and Virginia. Lives in Bethesda with her husband, Mike and two young children, Sophia and Matthew. To become nationally certified practitioners must demonstrate mastery of core skills and knowledge, pass an NCBTMB standard exam and every 4 years uphold the organization's standards of practice and code of ethics and take part in continued education.